In the great bath versus shower debate my loyalties have always been with the good old bath. There really is nothing more relaxing than a long hot bath, and there is no better way to enjoy a pampering bath than with some bath oil. If I’m being honest I’m pretty new to the concept of bath oils, but the few I have tried I have loved. So I was thrilled when we were kindly sent Blend Collective’s Bath & Shower Oil* and of course, headed straight for a bath. Two capfuls was all it took to transform my humble bath into a luxurious silky spa like treatment. The oil comes from the brands ‘Unwinding’ range and is packed full deliciously relaxing ingredients which are 100% natural such as, sandalwood, frankincense, cedar-wood and neroli. The scent of these ingredients fill your home with the most warming and rich scent that lasts long after your bath is gone, and the soothing sea kelp, passion fruit and corn silk ensure your skin feels just as good as it smells offering a deep moisturisation leaving your skin silky soft. The main thing I loved about this oil was, unlike other oils and bath potions, it didnt just smell great and make my bath water feel good, it actually made a difference to the look and feel of my skin, and managed to relax me right in the middle of my Uni deadlines, so it really must work! The other great thing with this oil (besides the lovely grown up packaging) is that it doubles up as a shower oil, which is perfect if your wanting the pampering benefits of an oil in half the time, you simply massage the oil into your skin and wash off in the shower, perfect! 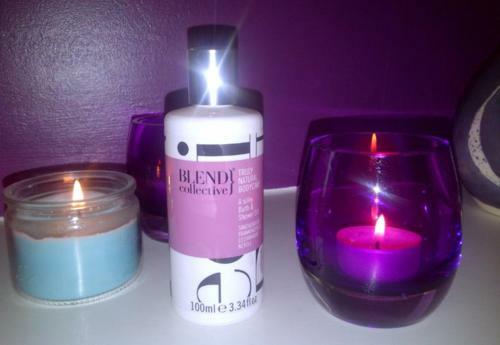 I absolutely love this product and I am currently lusting after the rest of the ‘Unwinding’ range especially the beautiful hand poured candle! Blend Collective’s Bath & Shower Oil is £24.95 and is available to purchase, along with the rest of the range from the Blend Collective website. This is the second post in my little bathtime series so expect to see some more!